ancient cities of the world. Your journey through time begins with a pleasant drive along the Aegean Coast. After an hour drive your first stop will be the Temple of Artemis, one of the 7 wonders of the ancients world. From here you will have the opportunity to view the Basilica of St. John and the 14th-century Isa Bey Mosque. After a short drive you will arrive to the ancient city of Ephesus. At one time, the city was the gateway to Asia Minor and boasted a population of 250,000. Formerly a seaport, it now lies several miles inland due to deposits of river silt that have collected over the centuries. The region is steeped in history, The Virgin Mary reputedly spent her last days at nearby Mt. Pagus. As you walk along the old marble streets, you will pass the Odeon and Upper Agora. You will also see the ornate Hadrian Temple, the remains of some Byzantine houses, the beautifully restored facade of the Celsus Library, the Thermal Baths of Scholastica, the Commercial Agora and the theatre, which accommodates 25,000 spectators and is still used for occasional performances. Continue along the colonnaded harbor boulevard, past the gymnasium and the remains of the stadium, as you head toward the exit gate and the lower parking area. Return to Izmir. traditional carpet making process from dying to spinning to weawing at a school where young girls are trained in the craft. Your last stop will be the visit to the Isa Bey Mosque, a delicate masterpiece of Turkish architecture from the fourteenth century. Afterwards drive back to Izmir. luncheon are featured in this fascinating, full-day excursion. As your vehicle makes its way along the Aegean Coast, you will pass some of the regions fertile lands. As you reach the silted valley, time seems to come to a halt and then reverse. After a steep drive up Mt. Pagus, you will arrive at a stone chapel. This converted house probably dates from the 1st century and was envisioned by a German nun as the site where the Virgin Mary spent her last days. Continuing to Ephesus, leave your coach at the parking area and proceed on foot through Magnesia Gate. As you stroll along the old marble streets, you will pass the Odeon and Upper Agora. You will also see the ornate Hadrian Temple, the remains of some Byzantine houses, the beautifully restored facade of the Celsus Library, the Thermal Baths of Scholastica, the Commercial Agora and the theatre, which accommodates 25,000 spectators and is still used for occasional performances. After your visit to Ephesus, re-board your vehicle for an enjoyable lunch. Afterwards enjoy a presentation about Turkish weavings , see the girls at the looms knotting carpets and kilims. Learn about the natural dyes and learn the differences between Silk , flosh , wool and cotton weavings for handmade rugs. The proprietors will give a fascinating demonstration of the local traditional crafts. Next is the Basilica of St. John, one of the seven churches of Asia Minor, is your final stop before your return to Izmir. Meet with your guide in front of the Izmir port or airport passenger Terminal. Depart the pier for the an hour drive to the magnificent site of Ephesus. Ephesus is the best preserved of the Greek/Roman cities in Anatolia and while you are visiting the ancient ruins of this magnificent site and your guide will bring them alive. You will see the beautiful Celsus Library, restored and reconstructed according to its original form by the architect Friedmund Hueber in the 1970's. The most spectacular building of Ephesus is the Grand Theater, built during the Hellenistic age to hold 25,000 spectators. The city was also the hometown of great philosopher Heraclitus. After a visit to Ephesus Antique Site, you will arrive at Sirince Village. This old Orthodox Village, 30 km from Kusadasi, was once "Cirkince"(ugly). Indeed its inhabitants gave this name on the purpose as they did not want to be bothered by foreigners nor to share the beauty of their village. Still after years, visitors understood that the village was not ugly and called it "Sirince" (pretty). Today the village is a perfect ynthesis of Turkish-Greek culture as of the 1920's; after the Turkish Independence War, people exchange between Greek and Turks has occurred and all those typical Greek houses, though they kept their original outside characteristics, have received the local layout inside. At Sirince Village you will have chance of seeing the local life at a village and purchasing some small local souvenirs and handicrafts. The village is also famous for its local grape and other fruit wines. During the lunch, mingle with the local people of the village. Have a cup of traditional Turkish coffee at the main coffee house of the village. Your last stop will be the visit to the Isa Bey Mosque, a delicate masterpiece of Turkish architecture from the fourteenth century. Boarding your vehicle in Izmir port drive to the north of Izmir, pass fertile fields and olive trees, to the present day, modern town of Bergama, once known as Pergamon, a great center of culture. The ancient city was a capital of the Pergamon Kingdom, and it was here that parchment paper was invented. Today, Pergamon is one of Turkey's finest archeological sites. Drive up to the Acropolis, to see the remains of the citadel and the city walls, the foundations of the Zeus Altar, and the Royal Palace. The famous Pergamon Library once contained 200.000 scrolls which were a gift to Cleopatra from Mark Anthony. Walk through the Agora and see the restored Trajan Temple and the remains of the Demeter, Athena and Dionysus Temples. On the steep slopes of the Acropolis you will visit the Theatre, which once held as many 15.000 spectators, view the town and its surroundings from this site. Continue to the town en route, see the Red Basilica which was used as a temple dedicated to the Egyptian godess of Serapis. Enjoy lunch in local Restaurant of Bergama and have a taste of Turkish food. In the afternoon, visit the Asclepion, a healing center from the 4th century BC and one of the most important sites of Pergamon. Here patients had herbalistic, aquatic and psychological treatment. Visit the Temple of Asclepios, the theatre, and walk through the sacred corridor and down the ancient, arcaded, marble-paved boulevard. Afterwards see a private demonstration of the traditional carpet making process from dying to spinning to weawing at a school where young girls are trained in the craft. Learn about the natural dyes and learn the differences between Silk , flosh , wool and cotton weavings for handmade rugs. This tour is for those passangers who have previously visited Ephesus. ,The air conditioned vehicle will depart in the morning for an hour and a half drive inland to the ancient city of Sardes, one time capital city of the Lydian Kingdom, and the home of the fabled King Creosus and his riches. The army of Alexander the Great camped on the site; and later on, with the arrival of Christianity, one of the Seven Churches of Asia Minor was built here. In Sardes, you will visit the ruins of the Temple of Artemis, the remains of the Byzantine Church, . Extensive archaelogical exploration and some restoration of certain structures has been accomplished by teams working under the aegis of the University of Harvard and Stanford. As you stroll along the kingsway, you will see the remains one of the oldest Synagogues in Asia Minor and the wonderfully restored facade of the Gymnasium where both scholars and atlethes were trained. Enjoy your lunch at a local Restaurant Drive back to Izmir Upon return visit Kemeralti Market area, here see Kizlaragasi Han. The Ottoman Inn from 18th Century which is a fine example of the architecture. Browse thru the narrow streets and enjoy shopping before return to the ship. 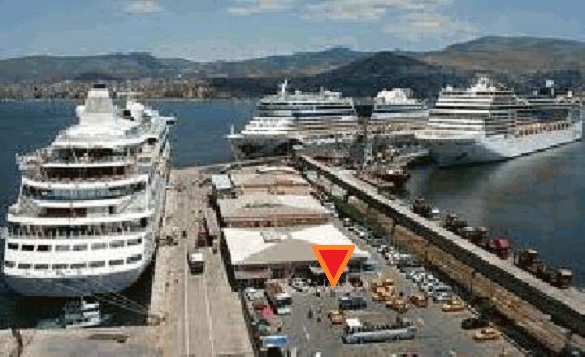 Your private tour guide will meet you in front of Izmir Port Passenger Terminal. He will be holding your name sign.